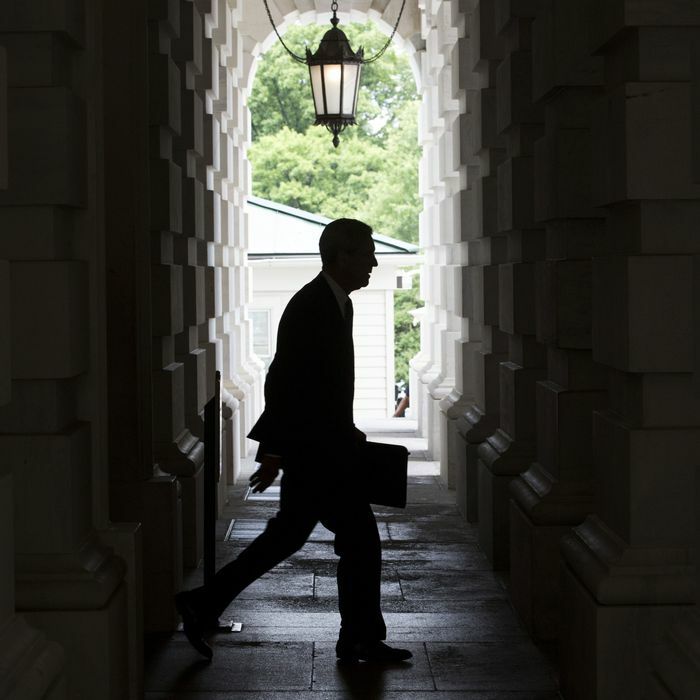 At long last, Special Counsel Robert Mueller has delivered his feverishly anticipated report on Russian interference in the 2016 presidential election to the Department of Justice. Details on the contents of the report are scarce, but multiple sources report that Mueller is not seeking any further indictments — a good sign for President Trump. Intelligencer staffers Jonathan Chait, Benjamin Hart, and Ed Kilgore chewed over their initial reactions to the report, and what might come next. This chat ran in the Daily Intelligencer newsletter, which combines a digest of the stories you care about with exclusive political commentary that you won’t find on the website. Ben: It finally happened: Robert Mueller has delivered his report. Nobody knows what’s in it yet, but Barr says he could brief Congress on its contents as early as this weekend. What are your initial reaction to this (possibly) seismic news? Ed: Dropping it on the weekend is a cruel confirmation of the 24/7 Trump news cycle. Ben: Yes, Mueller must hate the media as much as Trump does, with this timing. Jon: If Congress is briefed this weekend, news should leak very soon. Ed: Jon’s right: once any information is in congressional hands, it will be a competitive leak-a-thon. Jon: Barr’s letter seems to indicate he’ll disclose what he can. Ben: What do you make of Barr’s assertion that he might announce the “principle conclusions” very soon? Is this a hint that he’s ready to sing “no collusion” from the rooftops? Ed: So far no DoJ–White House tension, for what that’s worth. Jon: Perhaps? I don’t even have a firm grasp on Barr’s real motives for taking this job — if he’s a Trump hack or a Mueller ally, or something in between. Ed: So was the Bible. So was Finnegan’s Wake. Ben: Jon, do you agree with that? Ben: Multiple sources are now reporting that Mueller is recommending no further indictments. What does that tell us? Jon: It certainly seems to point toward an anticlimactic outcome. E﻿d: Since presumably there are people who (unlike Trump) can be indicted for helping him with collusion and/or obstruction, the fact that they likely won’t be is a pretty good thing for Trump. Ben: This fits with the rising tide of chatter in the last few days, from White House sources and Democrats alike, predicting that the report will end up being quite favorable to Trump — relatively speaking. Ed: Well, Republicans have long argued that if there’s no collusion, there’s no obstruction of justice, either. That’s not true from a legal point of view, but they’ll certainly make that argument. Jon: Right, you can argue that if they don’t find collusion, it’s because Trump obstructed the investigation. That’s usually why people obstruct justice. Ben: Also, if it’s just obstruction of justice, will anyone care all that much? Ed: As I’ve pointed out, nobody doubted the underlying crime in Watergate, which separated it from the Lewinsky scandal. So obstruction charges stuck in the first case, but not the second. Ben: Right — if it’s obstruction plus a new mountain of circumstantial evidence, that might be different. Ed: Then there’s the whole expectations issue with Mueller, with all the hopes from Democrats that his report would tighten a noose around Trump’s neck.